Before you buy or sell Indian art you need to be aware of the Indian Arts and Crafts Act of 1990. Did you know that it is illegal to sell an item as “Indian made” if it was not made by a federally (or state) recognized Indian or a certified tribal artisan? It is. Individuals who violate the Indian Arts and Crafts Act could face a fine of up to $250,000 or a 5-year prison term, or both. Businesses that violate the Act could face a fine of up to $1,000,000. This is serious business, but what is it for and what does it mean for you? The Act is essentially a truth-in-advertising law enacted to prevent false claims that an object is Indian made. The intention is to protect the integrity of Indian made goods. Why is the law necessary? Indian arts and crafts are big business. Many people want to buy Indian art because of it’s historical or cultural significance. Unfortunately the world is full of unscrupulous businesses and individuals who would like to cash in on the popularity of Indian arts and crafts. 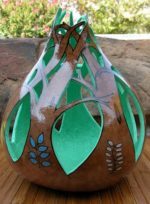 Effective November 20, 1996, The Indian Arts and Crafts Act of 1990, Public Law 101-644, was passed into law by the US Government to help protect real Indian artisans and craftsmen by making it illegal for non-Indians to claim, or in anyway represent, that their artwork was created by an Indian. The Act is intended to not only to protect the Indian artisans and craftsmen but also to protect buyers from unwittingly buying phony Indian art. In actuality, misrepresentation of imitation Indian art as being Indian made has been illegal since 1935, when the Indian Arts & Crafts Board was formed. However, the fines could not exceed $500 and jail time could not exceed six months. In addition, you had to provide proof that the misrepresentation was “willful” or intentional. This law was rarely enforced. In the 1990s, in response to growing sales in the Indian Arts & Crafts industry, a billion dollar market, the law was revamped and given some teeth. For artists who are federally recognized, or state recognized, this means that you can produce and sell Indian arts without concern. If you are a federally recognized, or state recognized, Cherokee you can honestly state that your products are made by a Cherokee. This law is intended to help legitimate Indian artists such as yourself. The law gets a bit confusing when it comes to artists who are members of non-recognized tribes or are a member of no tribe at all. According to the Indian Arts and Crafts Act of 1990 anyone who is not recognized by the federal or state government as an Indian cannot claim that their artwork is “Indian made.” Clearly a person who erroneously claims membership in a given tribe or erroneously claims to be an Indian is breaking the law. In addition, a person who is not a recognized Indian using the unqualified terms “Indian” or “Native American” is breaking the law, as this implies that the art is Indian made. So for example, if a company produces moccasins in China and imports them to the US under the name “Indian moccasins” they are violating the law. However, if they use the phrase “Indian style moccasins” they are not violating the law. Confusing? Well stay with me because the law gets even more complicated when it comes to the issue of Indian heritage versus tribal membership. You see, the law considers an Indian to be anyone who holds membership in a federally or state recognized tribe. However the law does not exclude a person from making accurate statements about their heritage. I will quote the example given by the Indian Arts and Crafts Board to clarify this aspect of the law. In other words, the law does not prohibit people from making the true statement that they are of Indian descent. In addition, there is a section of the law devoted to “tribal certification.” This designation is reserved for artists who, while not recognized as members of a given tribe, are of tribal descent and are chosen by that tribe to be certified as a “non-member Indian artisan.” Whether or not to certify a particular artisan is up to the individual tribe, however the artisan must be of Indian lineage of the given Indian tribe and the certification must be documented in writing by the governing body of the Indian tribe. Tribal certification is not enrollment; it simply means that that artist is certified by that particular tribe to create art as a certified artisan of that tribe. What does the law mean for Art buyers? In addition to protecting Indian artisans, this law is also intended to protect buyers. When buying Indian arts or crafts be sure that the artisan you are buying from is complying with the IACA. This does not mean that you should not buy from an artist of Indian descent who is non-recognized. In many cases people who can prove their Indian heritage without a doubt are not eligible for tribal enrollment because of a legal technicality. Simply be aware of who you are buying from and what you are buying. If you purchase something which you were falsely led to believe was “Indian made” you can file a report against the person who sold you the item or the artist, depending on the circumstances. The Indian Arts and Crafts Act of 1990 can be a bit confusing but it is very important. The key to this law, and with any other law, is to ask questions. If you are not sure how this law effects you write to the Indian Arts and Crafts Board for details. I’m sure they will be more than happy to explain the finer points of the law.